Note: We are reprinting this article — which was originally printed in The Hardball Times Baseball Annual 2014 — because it was nominated for a 2014 SABR Analytics Conference Research Award in Contemporary Baseball Commentary. Umpires have definitely been looking lower over the past couple of seasons. (via Tom Thai). When you think of baseball, you think of a game that never changes, right? The rules are the same as they were over 100 years ago, right? The bases still 90 feet apart? Well, one of the most important parts of baseball has changed significantly in the past five years, and the good news is that we have the technology to spot it. In 2007, new technology created and maintained by SportVision called PITCHf/x gifted public baseball analysts with a wealth of new data to explore. Using a system of cameras mounted in Major League Baseball stadiums to track the position of each pitch delivered over the course of the season, a number of pitch characteristics are derived and stored. These include pitch velocity, pitch movement and the location where the pitch crosses the front of home plate. Since that time, a number of studies have expanded our understanding of pitchers, hitters and umpires. Algorithms have been developed to classify pitches as curveballs or sliders, or any other pitch type based on the characteristics of the pitch. 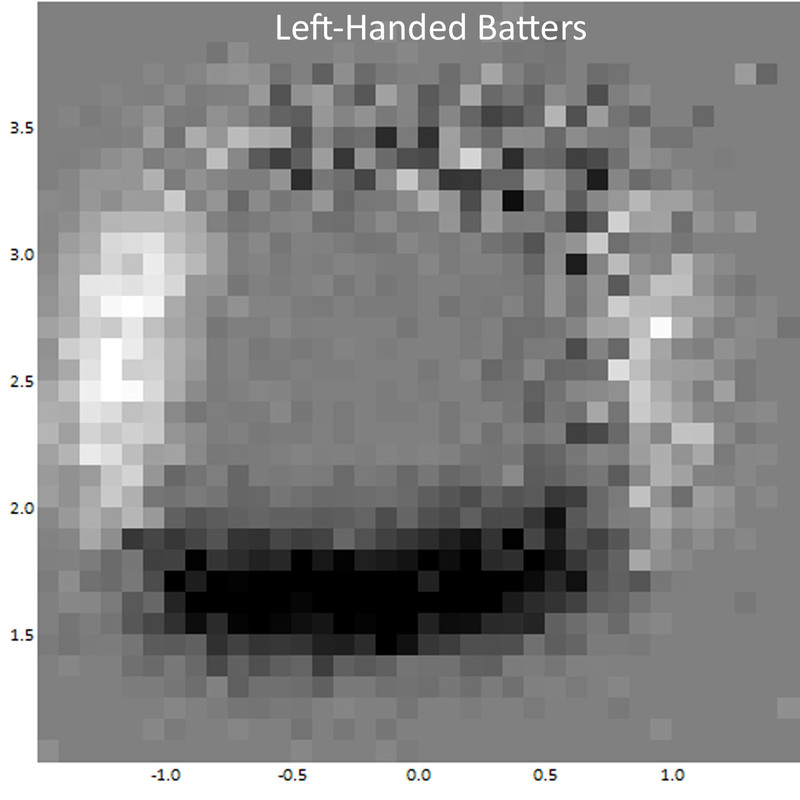 We can determine how often pitchers throw within the strike zone. 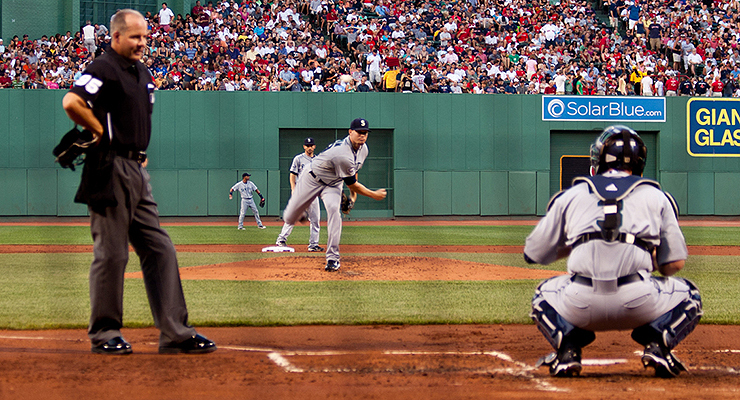 We can calculate how often hitters chase pitches out of the strike zone. We can compare the called strike zones among umpires and see how much these vary in a given season or over several seasons. It’s the strike zone that I’d like to examine more closely. I pulled PITCHf/x data and split the plane at the front of home plate into a 1×1 inch grid pattern to examine the effect of different game conditions on the called strike zone. For each cell of the grid, I calculated the percentage of called pitches that crossed the plate within it. I deemed the cell as part of the strike zone if more than half of those were called strikes. Aside from giving a nice visual of the called strike zone, this methodology makes it easy to calculate the area of the strike zone in square inches, simply by summing the number of cells included in the zone. I should point out that some inaccuracies do exist in the PITCHf/x data upon which this analysis is based. Noted PITCHf/x analyst Mike Fast attempted to calculate the average pitch location error by ballpark over the first several seasons that PITCHf/x data was available. His results showed that the typical error is less than one inch in both horizontal and vertical locations, in particular starting in the first full season of data in 2008. For the purposes of this study, given that I will be averaging data across all ballparks, such minor error effects should be insignificant. So what’s changed? The strike zone has changed. In fact, the strike zone is more than five percent bigger than it was five years ago, growing from 436 square inches in 2008 to 459 square inches this past year. Breaking things down a little, there has been a very clear expansion of the called strike zone down around the knees. In 2008, no square inch below 1.75 feet above the ground was in the strike zone (as I’ve calculated it). Now, there are 30 square inches in that area in which pitches are called strikes more often than not. I want to examine in more detail how the strike zone has changed since these data have been publicly available and investigate the effects on the game such changes may have made. An effective method to visually demonstrate the changing strike zone is to look at a map of the area around the strike zone showing the difference between the ways the zone is being called now and in the early days of PITCHf/x availability. Since a full season of PITCHf/x data was not collected in 2007, for the purposes of all comparisons in this study, I will compare 2013 data with 2008 data. This ensures that I am comparing full season data. 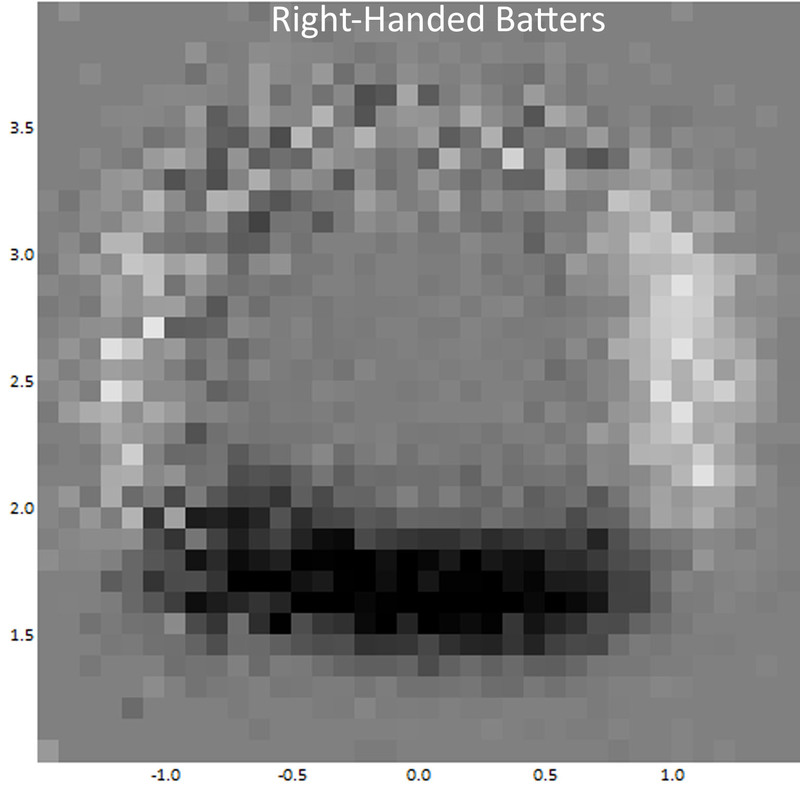 The maps presented below are split into two, one for left-handed hitters and one for right-handed hitters. Images are shown from the home plate umpire’s perspective. In these images, the grey background highlights areas with a relatively static called strike zone between the two seasons. Darker squares indicate a higher percentage of called strikes in 2013, while lighter squares imply that more balls were called in 2013. Several themes are immediately apparent from this visualization. The first is that there is no doubt the low strike was called more often this past season than just five years before. Note how everything two feet off the ground and below is trending toward more strikes being called. The second observation is that for both left-handed and right-handed hitters, the outside strike was called less often in 2013 than in 2008. These regions are both light in the images above. The final observation, admittedly a little less obvious, is that on the inside corner for all hitters, there appears to be a trend toward calling more pitches over the edge of the plate strikes, while pitches just inside are tending to be called balls more frequently. This is one of the presumed benefits of such a tracking system, in that it appears that umpires are improving on their success rate on the inside corner as it pertains to following the rulebook strike zone. The bottom of the strike zone (between 1.5 feet and two feet off the ground). Note that the outside areas measured are not symmetric about the center of home plate, because the strike zone for left-handed hitters has traditionally been called in a manner that sees the zone shifted away from the hitter by two to three inches. With the most prominent areas of interest identified, I can now check how much change has occurred at the outside edges and the bottom of the strike zone. The decline is evident across the board on the outside edge strike. We can only assume that these changes have been sanctioned by MLB, perhaps as a result of the PITCHf/x data. The zone for left-handed hitters has been pulling in bit by bit, until this past season when a significant reduction occurred. However, the called zone on the outside edge for right-handed hitters shows a different history. The largest single correction in this regard came in the 2009 season, when the zone contracted notably. Since that time, this segment has been treated roughly the same, with the largest improvements being in the pitches the most off the plate. There is no mistaking the trend across the league toward calling more strikes on pitches in the lowest potential area of the strike zone. In particular, the called strike rate for all pitches in the band between 1.5 feet and 1.75 feet off the ground has skyrocketed, more than doubling since the first season where PITCHf/x data was available, from 14.6 percent originally to 32.2 percent this past season. With the called strike zone changing as it has over the past several years, it is interesting to consider how pitchers have adjusted with respect to pitch location. After all, teams are certainly monitoring strike zone changes closely as well. You’d think that as pitchers became less likely to get called strikes on the outside edge and more likely to satisfy umpires at the bottom of the zone, there would be a shift in pitch location to reflect these facts. And it’s true. Pitchers have been keeping the ball down more frequently. Pitches have been taken from above 2.5 feet off the ground, in particular from the outside edge and beyond, and moved below 2.5 feet from the ground. This trend can be observed through the following table. On average, five out of every 100 pitches have been moved from above 2.5 feet to below this line since the introduction of the PITCHf/x data set. This means the high/low balance has shifted from 46/54 in 2007-2009 to 41/59 in 2013. This is quite a dramatic drop in pitch height. The following tables illustrate the magnitude of this shift in pitch location over time in the areas of interest for this study. It is notable to me that this transformation appears much milder in comparison to the rate of change of called strikes in these regions. To put things simply, it would appear that pitchers have taken about 1.3 percent of all pitches thrown and moved them from the outside edge to the bottom of the zone since the strike zone changes became most visible. The called strike zone data would suggest that, in particular, pitchers may not be taking full advantage of the area over home plate between 1.5 feet and 1.75 feet off the ground that we identified earlier as the fastest growing area for called strike percentage. Pitches to this area have risen from 7.4 percent of all pitches in the first three seasons of PITCHf/x data to only 8.2 percent of all pitches in 2013, despite more than twice the likelihood of being a called strike. The tables above are merely observations. There is nothing to prove how much, if any, the expansion of the called strike zone has to do with these changes in pitch locations. While I suspect this is part of the impetus, there is also perhaps a growing appreciation of pitchers generating ground balls, which involves a more focused approach to keeping the ball down. Differing pitching coach philosophies and different ballparks with their own park effects or even individual pitcher strengths may also be significant contributing factors. Doug Fister and Jered Weaver present an interesting contrast. These are the two right-handed starters with the most significant changes in pitch frequency in the growing lower area of the strike zone, but they’ve been moving in opposite directions. Consider their pitch location histories in these areas of interest during the period in which the most prominent strike zone changes have been observed. Fister’s rise to success has been partly fueled by his growing attention to the lower part of the strike zone. This rise is most notable since his time in Detroit, where all Tigers starters have pitched more frequently than average to the bottom area of the zone. Despite his falling numbers to the outside regions of study, Bill Petti and Jeff Zimmerman’s Edge% statistic—which represents pitch frequency to the edges of the plate—indicates that Fister has been at an elite level in recent seasons. Apparently, he is still throwing near the edges a lot, but is targeting the less dynamically changing inside corner more consistently and not pitching far enough outside as to be as affected by the strike zone tightening. As Weaver has seen his fastball velocity decline significantly, it seems that he has adjusted by targeting the outer edge of the plate more often. This is a common approach for pitchers as they age. Unfortunately for him, he has done so at precisely the time when the strike zone is squeezing in at the sides and showing the most pronounced addition at the bottom. All things considered, hitting the edges of the plate is not a bad practice at all. It just happens that a pitcher can expect, on average, fewer called strikes in these areas than just a few seasons ago. Of course these observations of strike zone differences are averages, and individual circumstances such as having a catcher who excels at pitch receiving (such as Hank Conger) and a pitcher with exceptional pitch movement (such as Weaver) may be more important considerations. It appears clear to me that pitching success does not hinge on one’s ability to adapt to these strike zone changes with great efficiency. There are several examples of Cy Young Award-quality pitchers who have attacked the growing low strike area at well below the league average in recent seasons. It merely seems to me that pitchers would benefit by taking advantage of this newest addition to the called strike zone where possible, while recognizing that outer areas that have traditionally been called strikes are contracting. As the called strike zone has changed and pitchers have started keeping the ball down more often, it is worthwhile asking whether hitters have adjusted their swing tendencies. We might expect fewer swings off the outside corner, but more swings in the newly called low-strike region. On the whole, these changes are not as clearly evident as the others, but we do see them. This aligns with the shift in the called strike zone and coincides with movements in pitch location by pitchers around the league. The following table shows the magnitude of the swing differences. For both outside edges, it is hard to point to a consistent trend in batter swing tendencies. While in general we can say that in 2013 the swing rates were lower compared to early PITCHf/x seasons, the decline has not been close to monotonic nor has it been very significant in nature. Perhaps the most obvious decline here has been realized by left-handed hitters off the outside corner in the most recent season, coincident with the largest single-year drop in called strike rate in this area over the years of study. Swing rates on lower pitches have been on the rise since 2010, matching closely with the timing of the expansion of the strike zone in this low area, as shown earlier. The area between 1.5 feet and 1.75 feet off the ground is again the fastest changing region, with swing rates climbing from 42 percent in the early years of PITCHf/x data to 45.4 percent in 2013. It appears that batters have adjusted more consistently to changes occurring at the bottom of the strike zone than at the outer edges of the plate. While I find the above observations of umpire, pitcher and batter behavior in the PITCHf/x era intriguing, the real question is what impact, if any, these changes have made on the game. We can measure a few specific impacts. Much has been written about the rising strikeout rate across the league over the past several seasons. Given that the strike zone has been changing most notably in our areas of interest, the net change in called strikeouts and walks for all plate appearances ending with a pitch to one of these areas can provide a measure of the impact of the zone change on league strikeout rate. The net effect of the changing strike zone has been an increase in called strikeouts and a decrease in walks. Here are two tables that show the results of called final pitches in strikeouts and walks, when those pitches cross home plate in the particular zones about which we have been talking. As you can see, the changes in the strike zone resulted in a net effect of 498 more called strikeouts and 685 fewer unintentional walks—based only on the impact of the final pitch. These effects are indisputable in that they are pitches in these regions that directly caused actual game occurrences. In my opinion, these differences are also almost completely caused by the set of changes we’ve discussed. Of course any effects of the heightened focus on catcher framing that has spawned from this same PITCHf/x data are inherently captured by the methodology used by this study. Another set of events that we can measure and compare are swinging strikeouts in the same regions, based only on the location of the final pitch in the strikeout. Once again, strikeouts are on the rise and are primarily being driven by occasions in which a hitter swings through a pitch in the lower region of interest for this study. Relatively speaking, pitchers threw roughly 8 percent more pitches to the area in 2013 than 2008 and hitters struck out about 11 percent more often on these pitches. In this case, I would expect that the changes in strike zone are not the only things making an impact on the swinging strikeout rate. Gradually climbing velocity rates are an example of a confounding factor that makes this particular increase a less direct effect of the changing strike zone. Nevertheless, in total these regions of study have witnessed an increase of 974 strikeouts and a decrease of 685 walks between 2013 and 2008. To put those numbers in perspective, in 2008 the league strikeout rate was 17.5 percent and the unintentional walk rate was 8 percent. If the 2008 strikeout and walk totals were adjusted by the effects that we’ve documented here, the strikeout rate would rise to 18 percent and the unintentional walk rate would drop to 7.6 percent. The actual 2013 average strikeout rate was 19.9 percent and the unintentional walk rate was 7.4 per cent. In other words, the changing strike zone has made an impact, but it’s only part of a bigger story. It is also no secret that run scoring has been down in recent seasons. Teams scored close to half a run less per game on average in 2013 than they did in 2008. To calculate the potential impact of the changing strike zone on run scoring, I looked at the effect that taken pitches in our regions of interest had on the count in the two seasons. For example, having a 1-1 pitch that was called a ball in 2008 suddenly get called a strike in 2013 changes the batting environment; the success rate of hitters is much lower when facing 1-2 counts than on 2-1 counts. Less success leads to fewer runs scored. To estimate the effect at this level, for each possible count in a plate appearance, I calculated the expected run difference between having the next pitch called a strike versus having it called a ball. To do so, I calculated the weighted on base percentage (wOBA) for all plate appearances in a season in which a particular count was reached at any point, then divided the change in wOBA when the next pitch was a ball or strike by the yearly wOBA constant to arrive at an expected run difference in each of these cases. The values that I calculated for each season are shown in the table below. These align closely with run values published by John Walsh based on 2007 data. If you think about this for a moment, it should be clear that a full-count pitch that is ruled a strike rather than a ball is producing a strikeout instead of a walk, so is actually changing the final outcome of a plate appearance. On the other hand, the first pitch of a plate appearance puts a hitter at 0-1 instead of 1-0, which is far from an insurmountable hole. It should be no surprise, then, that the former case produces a much higher expected run difference than the latter. With the expected run differences in hand, I counted the total number of called balls and strikes per count for each of our three study areas in 2008 and 2013. Then I calculated the total expected runs for the three areas based on the above table and the actual balls and strikes thrown. The following totals show the results. The expected run totals that I calculated were 2,606 runs in 2008 and 1,892 runs in 2013. This means the estimated cumulative effect of altered counts caused by calling the strike zone on the outside edge and lower limits as was done this past season compared to 2008 is that 714 fewer runs were scored. Of course this is just an estimate based on league average performances in each season, but it gives us an estimate of the kind of impact the called strike zone changes may have had on the game, aside from just more strikeouts and less walks. To put some context to that number, if we subtract this number of runs from the 2008 season total, the average number of runs per team per game drops from 4.65 to 4.50. In 2013 the average number of runs scored by a team in each game was 4.17. So you could say that one-third of the offensive decrease over the last five years has been due to the growing strike zone. The strike zone has been changing since the possibility arose of grading umpires with newly installed pitch-tracking technology. Presumably, MLB has backed these changes, as it has the tools to direct umpires to call the strike zone differently. In the PITCHf/x era, the bottom of the strike zone has been expanding at a higher rate than the edges have been contracting, leading to a larger strike zone. This imbalance has paved the way for higher strikeout totals and lower walk totals. The changes have altered more pitch counts in favor of the pitcher, leading in total to a larger number of less successful plate appearances from batters and fewer runs scored. The beauty of the situation is that all teams have access to all of this information, plus much more that is not available for public consumption. As in any other business, teams that are able to recognize trends quickly and adapt accordingly will put themselves at an advantage in this wonderful, hotly contested game. Great story. I am glad they are letting you talk about umpires at one of these conferences. I have collected Umpire Strikezone Scores since 2008. In 2013 in the World Series they called 68 pitches strikes that were really balls and ten pitches balls that were really strikes. In the last three games it was 38 to 1. If these strikezone graphs were shown live in every ballpark. The offense would improve because the umpires would call the game correctly. Who is to say what is “correct” in a dynamically evolving environment? Which decade’s strike zone is the real zone? In-game adjustment is a skill for both pitchers and hitters, so as long as calls are consistent, I am not sure I feel the same contempt. Great article, good analysis. One thing I’m curious about — how much has the changing zone been the result of umpires changing their zone, and how much is the result of new umpires replacing retiring umpires? One quick test — take all umpires who have been active since 2008, and compare their average strike zone 2008-2010 to 2011-2013 (or just 2008 vs. 2013, as in the above images). Do they show similar patterns to the aggregated analysis? I’m wondering if the increase in breaking balls thrown in the time frame of the study could be influencing the expansion of the strike zone. Do you have data comparing what types of pitches in the lower part of the zone are being called strikes? I can’t track it down right now, but read that the average height (and weight) of umpires fell from 6’2″ in the 1980s to 5’11” in the 2010s. Is there any evidence that shorter umpires are more likely to see (and thus call) a low strike? I did not, however, find anything significant to publish on this topic. Really impressive work. Jon. You talked about umpire height as a possible source of bias. Is there usable data concerning average height of players in the periods analyzed? The eyeball test says players are getting bigger, not smaller, but if not, there’s a potentially significant factor. Maybe the zone SHOULD be getting fractionally lower. Very good work. Beyond adjustments by individual players, is this likely to affect the relative values of types of players? Among pitchers, for example, those with sinking fastballs and 6-12 curves might do better (unless they’re Barry Zito). BTW, Mike Trout, hits over .350 in the lower half of the strike zone, so maybe the change in strike calls is coinciding nicely with his rise to stardom. Excellent read. I presume this expansion of the lower half of the strike zone is also semi-responsible for the dip in HRs hit and thus runs scored. It also makes it clear why groundball pitchers and infield defense seem to be more important than ever to teams, especially those who more sabermetrically inclined.